Heavy metal is a rapidly growing force on the Indian subcontinent, and this region of the world is rapidly getting its own brand of hyper brutal and extremely fast heavy metal music. Yet what no band (to my knowledge) has done before Dying Out Flame is combine the traditional music of the region with its new brand of hyper speed death metal. 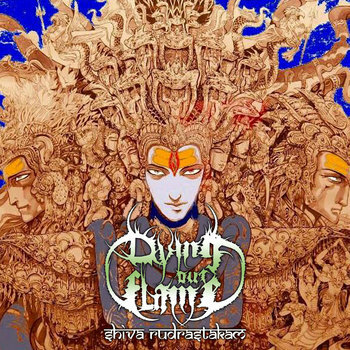 There is something strangely majestic about this bands new record Shiva Rudrastakam, it captures the ancient magic of the Himalayas, but also shows us the glorious power of true death metal. Part of what makes Shiva Rudrastakam so interesting to me is the incredible contrast that is embodied. Sure, there are some transitions between the more traditional parts and the metal parts, but it's significantly less than you'd expect. Oftentimes the changes feel a bit fragmented, leaving the listener reeling as they try to grasp on to this frighteningly unique sound. In the long run though this is actually really satisfying, it makes for a record that you can't always perfectly predict, and that makes it fun. As the band blasts forward, these tracks grab you by the throat, shake you up, and then show you the eternal magic of one of the worlds oldest and most interesting civilizations. Perhaps traditional Nepalese music isn't as far removed from heavy metal as one might think. The blasting riffs and raging attack of this band seems to actually have a rather zen vibe at times. The repetition of "Namaste" and references to the "Three Eyed One" shows us that these guys are definitely turned on to something deeper. Shiva Rudrastakam is glorious because it combines the pure atavistic power of traditional music with the modern chrome glory of death metal (Even if this bands take on death metal is rather primitive at times). In other words, Dying Out Flame fuse old and new to find something that is ultimately greater.